Audi reinforces the mantra that good things come in small packages with the unveiling of the all-new A3 compact premium model at the 82nd Geneva Auto Show. 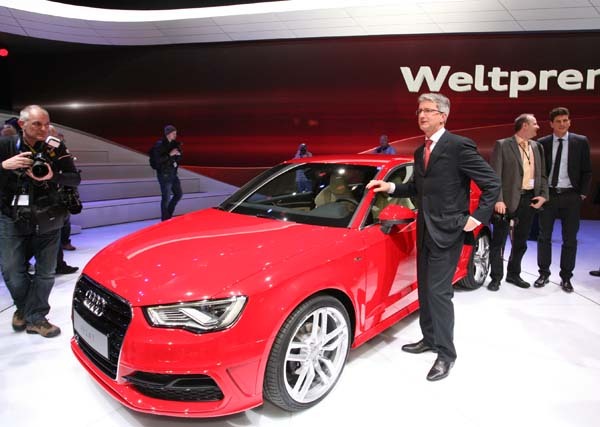 The new model exhibits an evolutionary progression of the A3 concept and will launch September 2012 in Europe with a 3 door coupe. Expect a one year delay coming to North America where the A3 will debut as a 4 door hatch with a sedan variant likely later. 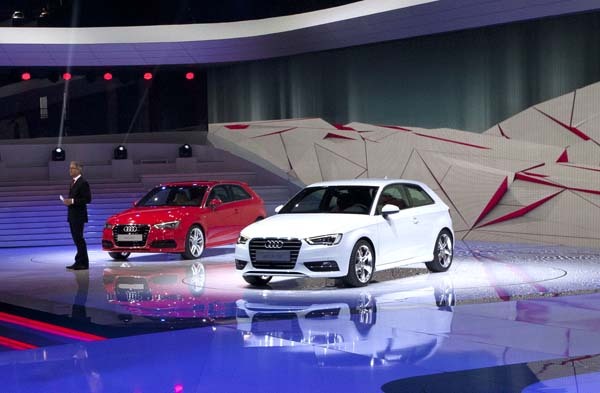 Under the new A3’s sculpted and sharper sheet metal lies further adoption of Audi’s lightweight technology. The use of lightweight steel and alloys has reduced the weight of the coupe by 80 kilograms. In keeping with the move to smaller more efficient engines, Audi will launch the A3 with a choice of three engines; a 1.4L TFSI, 1.8L TFSI gasoline or a 2.0L TDI. A six speed manual transmission appears to be the the default transmission on the 1.4L and 2.0L models, with a 7 speed DSG model standard on the 1.8L vehicle. 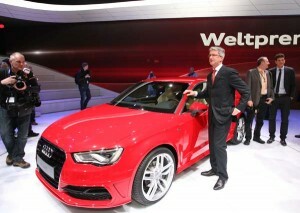 So far only the 1.8L gasoline model will be available with Quattro all wheel drive. The 2.0 TDI accelerates from 0-100km/h in 8.6 seconds and uses 4.0L per 100kms. A hyper-miling 1.6L TDI model is rumoured for a later introduction and should be capable of fuel ratings of 3.8L per 100kms. The 1.4 TFSI performs the run up to 100 kms/hr in 9.3 seconds and returns 5.2L/100kms. The 1.8 TFSI does 2.1 seconds better than the 1.4L’s acceleration time, and amazingly still manages 5.6L/100kms. The addition of stop/start technology in Europe have helped to reduce fuel economy by as much as 12% across the range. This technology have not yet made it to North America and it remain to be seen if Audi will step back the engine sizes to match the models available in Europe. Another first for the A3 will be the addition of Audi Drive Select. The system allows drivers to tailor the vehicle dynamics to one of five preset modes; Auto, Comfort, Dynamic, Individual or Efficiency. Safety systems from the A6 and A8 sedans have finally filtered down to the A3. These systems include adaptive cruise control with pre-sense, which can begin partial braking to lower speed prior to a collision. The system can also initiate full braking in emergency situations. Other safety features include active lane assist, side assist and traffic sign recognition, using on-board cameras, GPS and radar systems to assess the road. The parking assist system in the A3 now mimics the system last seen on the A8 providing an overhead, birds eye view of the vehicle surroundings while attempting to park. Overall Audi have bolstered the premium angle on its compact A3 model. Inside the cabin the A3 will get the industry leading MMI infotainment system used on higher end Audi models. An LCD panel either 5.8 or 7 inches in size will retract into the dash. Perhaps competition in the marketplace from both Mercedes with its new B Class and BMW with the 1 series, have borne fruit with the introduction of this new and highly improved A3.